Next week, Fox Home Entertainment, is finally, thankfully putting together the Season 1 release of FX’s hit show, American Horror Story. The set will ooze and waft its way onto Blu-ray and DVD on September 25, but in the meantime, you can reminisce over your favorite horror moments and think about how sweet you would look toting around an American Horror Story iPhone case. This is the official American Horror Story Blu-ray giveaway, replete with the pnone case, all 12 episodes in high definition and a slew of bonus features! You don’t even have to put yourself in danger to get your hands on one of these beautiful prize packages! 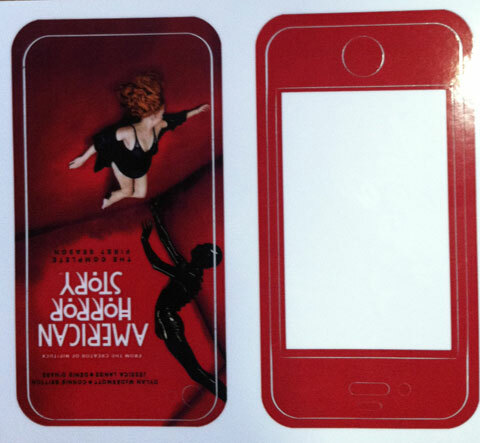 If the glorious cover art with the set is not enough to convince you to enter, Fox Home Entertainment also has some iPhone covers in the works for fans. The skins are red and mimic the box art on the Season 1 cover. They’ll definitely stand out. Entering is easy. Just click on over to our Facebook Contest Post, "Like" our page if you haven't already, and then leave a comment on the page telling us what your biggest scare ever has been. The contest ends at the witching hour, midnight EST on Wednesday, September 26. If you enter, please make sure we can contact you via Facebook. If you have it set to where we can't message you, your prize will go to somebody else. The winner will be notified via Facebook direct message and asked to provide their mailing addresses (no P.O. boxes please). Only U.S. residents may apply. Prize packs will be mailed directly to the winner. No purchase necessary. Failure to comply with the rules will result in disqualification and subsequent mockery. Good luck!